Khālid ibn al-Walīd ibn al-Mughīrah al-Makhzūmī (Arabic: أبو سليمان خالد بن الوليد بن المغيرة المخزومي‎‎; 585–642), commonly known as simply Khalid ibn al-Walīd, was an army commander under Abu Bakr and Umar ibn Khattab. It was under his military leadership that Arabia, for the first time in history, was united under a single political entity, the Caliphate. 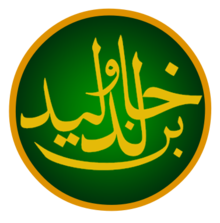 Khalid ibn al-Walid (Khalid son of al-Walid) was from the Meccan tribe of Quraysh, from a clan that initially opposed Muhammad. He played a vital role in the Meccan victory at the Battle of Uhud against the Muslims. He converted to Islam, and joined Muhammad after the Treaty of Hudaybiyyah and participated in various expeditions for him, such as the Battle of Mu'tah, which was the first battle between the Romans and the Muslims. Khalid ibn Al-Walid reported that the fighting was so intense, that while fighting, he broke nine swords in the battle. This earned him the title ‘Saif-ullah' meaning "The Sword of Allah". Khalid took over after Zayd ibn Haritha, then Jafar ibn Abi Talib, then Abdullah ibn Rawahah were killed. After Muhammad's death, he played a key role in commanding Medinan forces for Abu Bakr in the Ridda wars, conquering central Arabia and subduing Arab tribes. He captured the Sassanid Arab client Kingdom of Al-Hirah, and defeated the Sassanid Persian forces during his conquest of Iraq (Mesopotamia). He was later transferred to the western front to capture Roman Syria and the Byzantine Arab client state of the Ghassanids. Although Umar later relieved him of high command, he nevertheless remained the effective leader of the forces arrayed against the Byzantines during the early stages of the Byzantine–Arab Wars. Under his command, Damascus was captured in 634 and the key Arab victory against the Byzantine forces was achieved at the Battle of Yarmouk (636), which led to the conquest of the Bilad al-Sham (Levant). In 638, he was dismissed from military services. Khalid fought around 200 battles, both major battles and minor skirmishes as well as single duels, during his military career. Having remained undefeated, he is claimed by some to be one of the finest military generals in history. Khalid was born c. 585 in Mecca. His father was Walid ibn al-Mughirah, Sheikh of the Banu Makhzum, a clan of the Arab tribe of Quraysh. Walid was known in Mecca by the title of al-Waheed - "the Loner". Khalid's mother was Lubabah al-Sughra bint al-Harith, a paternal sister of Maymunah bint al-Harith. Soon after his birth, in accordance with the traditions of the Quraysh, Khalid was sent to a Bedouin tribe in the desert, where a foster mother nursed him and brought him up in the clear, dry and unpolluted air of the desert. At the age of five or six, he returned to his parents in Mecca. During his childhood Khalid suffered a mild attack of smallpox, which he survived, but it left some pockmarks on his left cheek. The three leading clans of Quraysh at that time were Banu Hashim, Banu Abd ad-Dar and Banu Makhzum, the latter clan being responsible for the matters of warfare. As a member of the Makhzum clan, who were amongst the best horsemen in Arabia, Khalid learned to ride and use such weapons as the spear, the lance, the bow and the sword. The lance was said to be his favorite among the weapons. In youth he was admired as a renowned warrior and wrestler among the Quraysh. Khalid was a cousin of Umar ibn Khattab, the future second Caliph, and they looked very similar. Map of the Battle of Uhud, showing Khalid's flanking movement against Muslim army, a maneuver that won the battle for the Quraysh. Not much is known about Khalid during the early days of the preaching of Muhammad. His father was known for his hostility against Muhammad. Following the migration of Muhammad from Mecca to Medina, many battles were fought between the new Muslim community at Medina and the confederacy of the Quraysh. Khalid did not participate in the Battle of Badr—the first battle fought between Muslims and Qurayshites—but his brother Walid ibn Walid was caught and made a prisoner. Khalid and his elder brother Hasham ibn Walid went to Medina to ransom Walid, but soon after he was ransomed, Walid, amidst the journey back to Mecca, escaped and went back to Muhammad and converted to Islam. Khalid's leadership was instrumental in turning the tables and ensuring a Meccan victory during the Battle of Uhud (625). In 627 AD he was a part of Quraysh's campaign against the Muslims, resulting in the Battle of the Trench, Khalid's last battle against Muslims. A peace agreement of ten years was concluded between the Muslims and Quraysh of Mecca at the Treaty of Hudaybiyyah in 628. It has been recorded that Muhammad told Khalid's brother, Walid bin Walid, that: "A man like Khalid, can't keep himself away from Islam for long". Walid wrote letters to Khalid persuading him to convert. Khalid, who was not unduly drawn towards the idols of the Kaaba, decided to convert to Islam and is said to have shared this matter with his childhood friend Ikrimah ibn Abi Jahl who opposed him. Khalid was threatened by Abu Sufyan ibn Harb with dire consequences, but was restrained by Ikrimah who is reported to have said: "Steady, O Abu Sufyan! Your anger may well lead me also to join Muhammad. Khalid is free to follow whatever religion he chooses". In May 629, Khalid set out for Medina. On the way he met 'Amr ibn al-'As and Uthman ibn Talhah, who were also going to Medina to convert to Islam. They arrived at Medina on 31 May 629 and went to the house of Muhammad. Khalid was received by his elder brother Walid bin al-Walid and was first among the three men to enter Islam. I was sure, taking into consideration your brilliance, your wisdom and foresight that surely one day you would accept Islam as your religion. After that, Khalid requested Muhammad to pray to Allah to forgive his previous sins. Then Muhammad prayed to Allah to forgive and have mercy on him. In 629 C.E, an expedition was prepared to take punitive action against the Ghassanids, a vassal state of Eastern Roman empire. Muhammad appointed Zayd ibn Harithah as the commander of the force. In the event of Zayd's death, the command was to be taken over by Ja`far ibn Abī Tālib, and if Jafar were to be killed, the command would be in the hands of `Abd Allah ibn Rawahah. In the event that all three were killed, the men of the expedition were to select a commander from amongst themselves. In September 629 C.E., the Battle of Mu'tah took place between Muslims and the forces of the Byzantine Empire. All three named commanders were slain during the Battle, and Khalid was selected as the commander. He was able to maintain his heavily outnumbered army of 3,000 men against an army of 10,000 of the Byzantine Empire and Ghassanid Arabs. Khalid assumed command of the Muslim army at the crucial moment, and turned what would have been a bloody slaughter into a strategic retreat and saved the Muslim army from total annihilation. During nightfall, Khalid sent some columns behind the main army, and the next morning prior to the battle they were instructed to join the Muslim army in small bands, one after the other, giving an impression of a fresh reinforcement, thus lowering the opponent's morale. Khalid somehow stabilized the battle lines for that day, and during the night his men retreated back to Arabia. Believing a trap was waiting for them, the Byzantine troops did not pursue. Khalid is said to have fought valiantly at the Battle of Mu'tah and to have broken nine swords during the battle. After the Battle of Mu'tah, Khalid was given the title Sword of God for bringing back his army to fight another day. A year later, in 630, the Muslims advanced from Medina to conquer Mecca. In the Conquest of Mecca Khalid commanded one of the four Muslims armies that entered Mecca from four different routes, and routed the Qurayshi cavalry. Later that year, he participated in the Battle of Hunayn and the Siege of Ta'if. It is said that on his Battle in Hunayn, he suffered grievous and deep wounds. But after gaining victory, Muhammad visited him and treated his wounds which healed quickly. He was part of the expedition to Tabuk under the command of Muhammad, and from there he was sent to Daumat-ul-Jandal where he fought and captured the Arab Prince of Daumat-ul-Jandal, forcing Daumat-ul-Jandal to submit. In 631 he participated in the farewell hajj of Muhammad. During which he is said to have collected a few hairs of Muhammad as a holy relic, believing that they would help him win his battles. In January 630 AD (8AH, 9th month, of the Islamic calendar), Khalid ibn al-Walid was sent to destroy the Idol Goddess al-Uzza, worshipped by polytheists. He did this, killing a woman Muhammad claimed was Al Uzza. Khalid ibn al-Walid was also sent to invite the Banu Jadhimah tribe to Islam. They said 'Saba'na, Saba'na' (we became Sabians), so Khalid took them prisoners and began executing some of them, due to past enmity, before being stopped by Abdur Rahman bin Awf. Some men from Banu Jadhimah had previously killed Al-Fakih Ibn Al-Mughirah Al-Makhzumi, the uncle of Khalid, and Awf Ibn Abd-Awf, father of Abdur Rahman bin Awf. Muhammad felt so sad when he heard of Khalid's behavior; then paid money to the relatives of the dead and compensated for the property destroyed and he kept repeating aloud: "O God, I am innocent of what Khalid ibn al-Walid has done!" Muhammad also sent Khalid on an expedition to Dumatul Jandal, to attack the Christian Prince Ukaydir who lived in a castle there. This took place in March 631 AD (9AH,11th month of the Islamic calendar). In this campaign, Khaled took the Prince hostage and threatened to kill him until the door of the castle was opened. Muhammad then later ransomed him in exchange for 2000 camels, 800 sheep, 400 sets of armour, 400 lances, and a pledge to pay jizyah. In April 631 AD, Muhammad sent Khalid on a second expedition to Dumatul Jandal to destroy the pagan Idol, Wadd. Khalid destroyed the statue as well as the shrine and killed those who resisted. Map detailing the route of Khalid ibn Walid's conquest of Arabia. After the death of Muhammad, many powerful Arab tribes broke away in open revolt against the rule of Medina. Caliph Abu Bakr sent his armies to counter the rebels and apostates. Khalid was one of Abu Bakr's main advisers and an architect of the strategic planning of the Riddah wars. He was given the command over the strongest Muslim army and was sent towards central Arabia, the most strategically sensitive area where the most powerful rebel tribes resided. The region was closest to the Muslim stronghold of Medina and was the greatest threat to the city. Khalid first set out for the rebel tribes of Tayy and Jalida, where Adi ibn Hatim—a prominent companion of Muhammad, and a chieftain of the Tayy tribe—arbitrated, and the tribes submitted to the Caliphate. In mid-September 632 AD, Khalid defeated Tulaiha, a main rebel leader who claimed prophethood as a means to draw support for himself. Tulaiha's power was crushed after his remaining followers were defeated at the Battle of Ghamra. Khalid next marched to Naqra and defeated the rebel tribe of Banu Saleem at the Battle of Naqra. The region was secured after the Battle of Zafar in October 632 with the defeat of a tribal mistress, Salma. Once the region around Al- Medina, the Islamic capital, was recaptured, Khalid entered Nejd, a stronghold of the Banu Tamim tribes. Many of the clans hastened to visit Khalid and submit to the rule of the Caliphate. But the Banu Yarbu' tribe, under Sheikh Malik ibn Nuwayrah, hung back. Malik avoided direct contact with Khalid's army and ordered his followers to scatter, and he and his family apparently moved away across the desert. He also collected taxes and sent his men to Medina to deliver them. Nevertheless, Malik was accused of rebelling against the state of Medina and charged for entering into an anti-Caliphate alliance with Sajjah, a self-proclaimed prophetess. Malik was arrested along with his clansmen, and asked by Khalid about his crimes. Upon hearing Malik's response: "your master said this, your master said that" referring to Abu Bakr, Khalid declared Malik a rebel apostate and ordered his execution. Abu Qatada Ansari, a companion of Muhammad, who accompanied Khalid from Medina was so shocked at Malik's murder by Khalid that he immediately returned to Medina, and told Abu Bakr that he refused to serve under a commander who had killed a Muslim. The death of Malik and Khalid's taking of his wife Layla created controversy. Some officers of his army—including Abu Qatadah—believed that Khalid killed Malik to take his wife. After the pressure exerted by Umar—Khalid's cousin and one of Caliph Abu Bakr's main advisors—Abu Bakr called Khalid back to Medina to explain himself. I would not sheathe what Allah had unsheathed against the disbelievers. Khalid then crushed the most powerful threat to the nascent Islamic state of Medina: Musaylimah, a claimant to prophethood, who had already defeated two Muslim armies. In the third week of December 632, Khalid won a decisive victory against Musaylimah at the Battle of Yamama. Musaylimah died in the battle, and nearly all resistance from rebelling tribes collapsed. Map detailing the route of Khalid ibn Walid's conquest of lower Mesopotamia (Iraq). Submit to Islam and be safe. Or agree to the payment of the Jizya (tax), and you and your people will be under our protection, else you will have only yourself to blame for the consequences, for I bring the men who desire death as ardently as you desire life. He won quick victories in four consecutive battles: the Battle of Chains, fought in April 633; the Battle of River, fought in the third week of April 633; the Battle of Walaja, fought in May 633 (where he successfully used a double envelopment manoeuvre), and Battle of Ullais, fought in the mid-May 633. In the last week of May 633, al-Hira, the regional capital city of lower Mesopotamia, fell to Khalid. The inhabitants were given peace on the terms of annual payment of jizya (tribute) and agreed to provide intelligence for Muslims. After resting his armies, in June 633, Khalid laid siege to Anbar which despite fierce resistance fell in July 633 as a result of the siege imposed on the town. Khalid then moved towards the south, and captured Ein ul Tamr in the last week of July, 633. By then, nearly all of lower Mesopotamia, (the northern Euphrates region), was under Khalid's control. Meanwhile, Khalid received a call for relief from northern Arabia at Daumat-ul-Jandal, where another Muslim Arab general, Iyad ibn Ghanm, was being surrounded by rebel tribes. August 633, Khalid went to Daumat-ul-jandal and defeated the rebels in the Battle of Daumat-ul-jandal, capturing the city fortress. On his journey back to Mesopotamia, Khalid is said to have made a secret trip to Mecca to participate in Hajj. On his return from Arabia, Khalid received intelligence entailing a concentration of a large Persian army and Christian Arab auxiliaries. These forces were based in four different camps in the Euphrates region at Hanafiz, Zumail, Saniyy and the largest being at Muzayyah. Khalid avoided a pitched battle with a large united Persian force and decided to attack and destroy each of the camps in a separate night attacks from three sides. He divided his army in three units, and attacked the Persian forces in coordinated assaults from three different directions during the night, starting from the Battle of Muzayyah, then the Battle of Saniyy, and finally the Battle of Zumail in November 633 AD. This string of Muslim victories curtailed Persian efforts to recapture lower Mesopotamia and left the Persian capital Ctesiphon unguarded and vulnerable to Muslim attack. Before assaulting the Persian capital, Khalid decided to eliminate all Persian forces from the south and west, and thus marched against the border city of Firaz, where he defeated a combined force of Sassanid Persians, Byzantine Romans and Christian Arabs and captured the city's fortress during the Battle of Firaz in December 633. This was the last battle in his conquest of lower Mesopotamia. While Khalid was on his way to attack Qadissiyah, a key fort on the way to Ctesiphon, he received a letter from Abu Bakr and was sent to the Byzantine front in Syria to assume the command of Muslim armies with the intent of conquering Roman Syria. During his stay in Iraq, Khalid was also installed as military governor of the conquered territory. Map detailing Rashidun Caliphates invasion of the Levant. After the successful invasion of the Sassanid Persian province of Iraq, Caliph Abu Bakr sent an expedition to invade the Levant (Roman Syria). The invasion was to be carried out by four corps, each with its own assigned targets. The Byzantines responded to this threat by concentrating their units at Ajnadyn (a place in Palestine, probably al-Lajjun) from different garrisons. This move tied down the Muslim troops at border regions, as with this large force at their rear, Muslim armies were no longer free to march to central or northern Syria. Muslim forces apparently were too small in numbers to counter the Byzantine threat, and Abu Ubaidah ibn al-Jarrah, the chief Muslim commander of the Syrian front, requested reinforcements from Abu Bakr. The latter responded by sending reinforcements led by Khalid. There were two routes towards Syria from Iraq, one was via Daumat-ul-Jandal (Now known as Skaka) and the other was through Mesopotamia passing through Raqqa. Since the Muslim forces in Syria were in need of urgent reinforcement, Khalid avoided the conventional route to Syria via Daumat-ul-Jandal because it was a long and would take weeks to reach Syria. He also avoided the Mesopotamian route because of the presence of Roman garrisons in northern Syria and Mesopotamia. Engaging them at the time when Muslim armies were being outflanked in Syria, was also ruled out since it would mean fighting on two fronts. Khalid selected a rather shorter route to Syria which unconventionally passed through the Syrian Desert. He marched his army though the desert, where traditions tells that his soldiers marched for two days without a single drop of water, before reaching a pre-decided water source at an oasis. Khalid is said to have solved the water shortage issue using a Bedouin method. Camels were made to drink water after intentionally denying them water for a lengthy time period, encouraging the camels to drink a lot of water at one time. Camels have the ability to store water in their stomach which in turn could be obtained by slaughtering them when necessary. Muslim troops rode entirely on camels and this method became an effective one for the Muslim army. Khalid entered Syria in June 634 and quickly captured the border forts of Sawa, Arak, Palmyra, al-Sukhnah, al-Qaryatayn and Hawarin. The latter two were captured after the Battle of Qaryatayn and the Battle of Hawarin. After subduing these desert forts, Khalid's army moved towards Bosra, a town near the Syria-Arabia border and the capital of the Arab Christian Ghassanid kingdom, a vassal of the eastern Byzantine Empire. He bypassed Damascus while crossing a mountain pass which is now known as "Sanita-al-Uqab" ("the Uqab pass") after the name of Khalid's army standard. On his way at Maraj-al-Rahat, Khalid routed a Ghassanid army in the brief Battle of Marj-al-Rahat. With the news of Khalid's arrival, Abu Ubaidah ordered Shurhabil ibn Hasana, one of the four corps commanders, to attack the city of Bosra. The latter laid siege to Bosra with his army of 4,000 men. The Byzantine and Christian Arab garrison which outnumbered Shurhabil's forces, made a sally and were likely to annihilate them when Khalid's cavalry arrived from the desert and attacked the rear of the Byzantine forces, relieving Shurhabil. The garrison retreated to the city's fortress. Abu Ubaidah joined Khalid at Bosra and Khalid, as per the caliph's instructions, took over the supreme command. The fortress of Bosra surrendered in mid-July 634, effectively ending the Ghassanid dynasty. After capturing Bosra, Khalid instructed all the corps to join him at Ajnadayn where they fought a decisive battle against the Byzantines on 30 July 634. Modern historians consider this battle to have been the key in breaking Byzantine power in Syria. Defeat at the Battle of Ajnadayn left Syria vulnerable to the Muslim army. Khalid decided to capture Damascus, the Byzantine stronghold. At Damascus, Thomas, son-in-law of Byzantine Emperor Heraclius, was in charge of the city's defense. Receiving intelligence of Khalid's march towards Damascus he prepared the city's defences. He wrote to Emperor Heraclius, who was at Emesa that time, for reinforcement. Moreover, Thomas, in order to delay or halt Khalid's advance and to attain time to prepare for a siege, sent his armies to move forward. Two of his armies were routed first at Yaqusa in mid-August and the other at Maraj as-Saffar on 19 August. Meanwhile, Heraclius' reinforcements reached Damascus before the other column of Heraclius reached the city which Khalid laid siege to on 20 August. To isolate Damascus from the rest of the region, Khalid placed the detachments south on the road to Palestine and in north at the Damascus-Emesa route, and several other smaller detachments on routes towards Damascus. Heraclius' reinforcements were intercepted and routed by Khalid at the Battle of Sanita-al-Uqab 30 km from Damascus. Geographical Map detailing the route of Khalid ibn Walid's invasion of Syria. Khalid led an assault and conquered Damascus on 18 September 634 after a 30-day siege. According to some sources, the siege is purported to have lasted some four or six months. Emperor Heraclius having received the news of the fall of Damascus, left for Antioch from Emesa. Khalid's cavalry attacked the Byzantine garrison of Damascus, which was also heading towards Antioch, catching up to them using an unknown shortcut, at the Battle of Maraj-al-Debaj, 150 km north of Damascus. Abu Bakr died during the siege of Damascus and Umar became the new Caliph. He dismissed his cousin Khalid from his command and appointed Abu Ubaidah ibn al-Jarrah the new commander in chief of Islamic forces in Syria. Abu Ubaidah got the letter of his appointment and Khalid's dismissal during the siege, but he delayed the announcement until the city was conquered. On 22 August 634, Abu Bakr died, having made Umar, Khalid's cousin, his successor. Umar's first move was to relieve Khalid from supreme command of Muslim Forces and appoint Abu Ubaidah ibn al-Jarrah as the new commander in chief of the Islamic army. Khalid had become a trial of disbelief (because of his undefeated wars) for the Muslims as they had attributed the wins of battles to the personality and figure of Khalid; Umar was reported as saying:"I did not fire Khalid ibn al Waleed because I am angry with him or because of betrayal of trust or responsibility but the reason was just that I wanted people to know that it is Allah who gives victory". This resulted in the dismissal of Khalid from supreme command and later in 638, from military services. Khalid, gave a pledge of loyalty to the new caliph and continued service as an ordinary commander under Abu Ubaidah. He is reported to have said: "If Abu Bakr is dead and Umar is Caliph, then we hear and obey". There was inevitably a slowdown in the pace of military operations, as Abu Ubaidah ibn al-Jarrah would move slowly and steadily and was a more cautious commander. The conquest of Syria continued under his Generalship and, Abu Ubaidah being an admirer of Khalid, gave him command of the cavalry and used him as a military advisor. Map detailing the route of Khalid ibn Walid's invasion of Central Syria. Soon after the appointment of Abu-Ubaidah as commander in chief, he sent a small detachment to the annual fair held at Abu-al-Quds, modern day Abla, near Zahlé 50 km east of Beirut. There was a Byzantine and Christian Arab garrison guarding that fair, however the size of the garrison was miscalculated by the Muslim informants. The garrison quickly encircled the small Muslim force. Before it would have been completely destroyed, Abu Ubaidah, having received new intelligence, sent Khalid to rescue the Muslim army. Khalid engaged and defeated them in the Battle of Abu-al-Quds on 15 October 634 and returned with tons of looted booty from the fair and hundreds of Roman prisoners. With Central Syria captured, the Muslims had dealt a decisive blow to the Byzantines. The communication between Northern Syria and Palestine was now cut off. Abu Ubaidah decided to march to Fahl (Pella), which is about 500 ft (150 m) below sea level, and where a strong Byzantine garrison and survivors of Battle of Ajnadayn were present. The region was crucial because from here the Byzantine army could strike eastwards and cut the supply lines and communications to Arabia. Moreover, with this large garrison at the rear, Palestine could not be invaded. The Muslim army moved to Fahl with Khalid leading the advance guard, only to find the plain being flooded by Byzantines engineers blocking the Jordan River. The Byzantine army was eventually defeated at the Battle of Fahl on the night 23 January 635. With the victory at Fahl, the Muslim army split, Amr ibn al-Aas and Shurhabil ibn Hasana moved south to capture Palestine, while Abu Ubaidah and Khalid moved north to capture Northern Syria. While the Muslims were occupied at Fahl, Heraclius, sensing the opportunity, quickly sent an army under General Theodras to recapture Damascus. Shortly after Heraclius dispatched this new army, the Muslims having finished the business at Fahl, were on their way to Emesa. The Byzantine army met the Muslims half way to Emesa, at Maraj-al-Rome. During the night Theodras sent half of his army towards Damascus to launch a surprise attack on the Muslim garrison. Khalid's spy informed him about the move, Khalid having received permission from Abu Ubaidah, quickly moved towards Damascus with his mobile guard. While Abu Ubaidah fought and defeated the Roman army in the Battle of Maraj-al-Rome, Khalid moved to Damascus with his Mobile guard attacking and routing General Theodras in the 2nd battle of Damascus. A week later, Abu Ubaida capture Baalbek (Heliopolis), where the great Temple of Jupiter stood, and sent Khalid straight towards Emesa. Emesa and Chalcis asked for peace for a year. Abu Ubaidah, accepted the offer and rather than invading the districts of Emesa and Chalcis, he consolidated his rule in conquered land and captured Hama, Ma’arrat an Nu’man. However, the peace treaties were on Heraclius' instructions to lull the Muslims and to secure time for preparation of defenses of Northern Syria. Having mustered sizable armies at Antioch, Heraclius sent them to reinforce strategically important areas of Northern Syria, most importantly the strong fortress of Chalcis. With the arrival of Byzantine army in the city, the peace treaty was violated. Abu Ubadiah and Khalid then marched to Emesa, and a Byzantine army that halted Khalid's advance guard was routed and the Muslims besieged Emesa which was finally completed in March 636 after two months of siege. Muslim and Byzantine Troop Movements before the battle of Yarmouk. After capturing Emesa, the Muslims moved north to capture the whole of the Northern Syria. Meanwhile, Heraclius had concentrated a large army at Antioch to roll back Syria. Khalid got the news from Roman prisoners in Northern Syria. After his past experiences Heraclius had been avoiding pitched battles with the Muslims. He planned to isolate the Muslim corps from each other, and separately encircle and destroy the Muslim armies. Five massive armies were launched in Syria from different routes in June 636 to recapture it. Khalid, sensing Heraclius' plan, feared that the Muslim armies would indeed be isolated and destroyed. In a council of war he suggested that Abu Ubaidah draw all the Muslim armies to one place so as to fight a decisive battle with the Byzantines. As per Khalid's suggestion, Abu Ubaidah ordered all the Muslim armies in Syria to evacuate the conquered land and concentrate at Jabiya. This maneuver gave a decisive blow to Heraclius' plan, as he did not wish to engage his troops in an open battle with the Muslims, where the Muslim light cavalry could be effectively used against the heavy and less mobile Byzantine cavalry. From Jabiya, on Khalid's suggestion, Abu Ubaidah ordered the Muslim army to withdraw to the plain of the Yarmouk River, which had a good supply of pasture and water and where cavalry could be used more effectively. Abu Ubaidah, in a council of war, transferred the supreme command of the Muslim forces to Khalid, who acted as a field commander in the battle and was the mastermind of the annihilation of the Byzantine army. On 15 August, the Battle of Yarmouk was fought, it lasted for 6 days and ended in a devastating defeat for the Byzantines. The Battle of Yarmouk is considered to be one of the most decisive battles of history. It was a historic defeat that sealed the fate of Byzantium in the Levant, the magnitude of the defeat was so intense that Byzantine forces were unable to recover from it for some time. It left the whole of the Byzantine Empire vulnerable to the Muslim Arab armies. The battle was the greatest battle ever fought on Syrian soil up to that point, and is believed to be the tactical marvel of Khalid. With the Byzantine army shattered and routed, the Muslims quickly recaptured the territory that they conquered prior to Yarmouk. 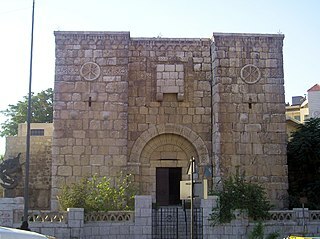 The Muslim forces moved south to a last Byzantine stronghold, Jerusalem, where many of the Byzantine survivors of the disaster at Yarmouk took shelter. The Siege of Jerusalem lasted four months after which the city agreed to surrender, but only to the caliph in person. Amr ibn al-Aas, one of the four corps commander, suggested that Khalid should be sent as caliph, because of his very strong resemblance with Caliph Umar. Khalid was recognized and eventually, Umar came and Jerusalem surrendered in April 637. After Jerusalem, the Muslim armies broke up once again. Yazid's corps came to Damascus and captured Beirut. Amr and Shurhabil's corps went on to conquer the rest of Palestine, while Abu Ubaidah and Khalid, at the head of a 17,000 strong army moved north to conquer whole of the Northern Syria. Map detailing the route of Khalid ibn Walid's invasion of Northern Syria. With Emesa already in hand, Abu Ubaidah and Khalid moved towards Chalcis, which was strategically the most significant fort of Byzantines. Through Chalcis, the Byzantines would guard Anatolia, Heraclius' homeland Armenia and the Asian zone's capital Antioch. Abu Ubaidah sent Khalid with his elite mobile guard towards Chalcis. The fort was guarded by the Greek troops under their commander, Menas, who was reported to be of high prestige, second only to the emperor himself. Menas, diverting from conventional Byzantine tactics, decided to face Khalid and destroy the leading elements of the Muslim army before the main body could join them at Hazir, 5 km east of Chalcis. The Roman army was totally annihilated at the Battle of Hazir, which even forced Umar to praise Khalid's military genius. Umar is reported to have said: "Khalid is truly the commander, May Allah have mercy upon Abu Bakr. He was a better judge of men than I have been". Abu Ubaidah soon joined Khalid at the virtually impregnable fort of Chalcis, which surrendered in June 637. With this strategic victory, the territory north of Chalcis lay open to the Muslims. Khalid and Abu Ubaidah next captured Aleppo from desperate Byzantine troops in October 637. The next objective was the splendid city of Antioch, the capital of the Asian zone of the Byzantine Empire. Before marching towards Antioch, Khalid and Abu Ubaidah decided to isolate the city from Anatolia; this was done by capturing all the fortresses that were providing strategic defense to Antioch, most importantly A'zāz at north east of Antioch. In order to save the empire from annihilation, a desperate battle was fought between the Muslim army and that of the defenders of Antioch outside the city near Orontes river, popularly known as Battle of Iron bridge. The Byzantine army was composed of the survivors of Yarmouk and other Syrian campaigns. After being defeated, the Byzantines retreated to Antioch and the Muslims besieged the city. Having little hope of help from emperor, Antioch surrendered on 30 October 637, with the terms that all Byzantine troops would be given safe passage to Constantinople. Farewell, a long farewell to Syria, my fair province. Thou art an infidel's (enemy's) now. Peace be with you, O' Syria – what a beautiful land you will be for the enemy hands. With the devastating defeat at Yarmouk his empire was extremely vulnerable to Muslim invasion. With few military resources left he was no longer in a position to attempt a military come back in Syria. To gain time for the preparations of the defense of the rest of his empire, Heraclius needed the Muslims occupied in Syria. He sought help of the Christian Arabs of Jazira who mustered up a large army and marched against Emesa, Abu Ubaidah's headquarters. Abu Ubaidah withdrew all his forces from Northern Syria to Emesa, and Christian Arabs laid siege to Emesa. Khalid was in favor of an open battle outside fort, but Abu Ubaidah rather sent the matter to Umar, who brilliantly handled it. Umar sent detachment of Muslim armies from Iraq to invade Jazira, homeland of the invading Christian Arabs, from three different routes. Moreover, another detachment was sent to Emesa from Iraq under Qa’qa ibn Amr, a veteran of Yarmouk who was sent to Iraq for the Battle of al-Qādisiyyah. Umar himself marched from Medina ahead of 1,000 men. The Christian Arabs, under this overwhelming response, abandoned the siege and hastily withdrew to Jazira. At this point Khalid and his mobile guard came out of Emesa and devastated their army, attacking them from rear. This was Heraclius' last attempt to achieve a comeback on the Syrian front. Map detailing the route of Khalid ibn Walid's invasion of Anatolia and Armenia. After the battle, Umar ordered the conquest of Jazira which was completed by late summer 638. After the conquest of Jazira Abu Ubaidah sent Khalid and Iyad ibn Ghanm (conqueror of Jazira) to invade the Byzantine territory north of Jazira. They marched independently and captured Edessa, Amida (Diyarbakır), Malatya and raided Byzantine Armenia up to Ararat region and also reportedly raided central Anatolia. Heraclius had already abandoned all the forts between Antioch and Tartus to create a buffer zone or no man's land between Muslim controlled areas and main land Anatolia. Umar for the time stopped his armies from advancing further into Anatolia, and instead ordered Abu Ubaidah, now governor of Syria, to consolidate his rule in conquered land of the Levant. At this point Umar is reported to have said: "I wish there was a wall of fire between us and Romans, so that they could not enter our territory nor we could enter theirs". Due to the dismissal of Khalid from the army and a famine and plague the next year, the Muslim armies were kept from invading Anatolia. The expedition to Anatolia and Armenia marked the end of the military career of Khalid. Khalid, by now, was at the height of his career, he was famous and loved by his men, for the Muslim community he was a national hero, and was publicly known as Sayf-ullah ("Sword of Allah"). An event happened shortly after Khalid's capture of Marash (Kahramanmaraş), in the autumn of 638, he came to know of Ash'as, a famous poet and warrior on Persian front, reciting a poem in praise of Khalid and receiving a gift of 10,000 dirhams from him, apparently from the state treasury. Umar and his senate identified this act as misuse of state treasure, though not as punishing as to lose one's office, Khalid was already warned not to act alone, he should seek permission from his commander or Caliph for such actions. He immediately wrote a letter to Abu Ubaidah asking him to bring Khalid in front of the congregation, his turban, and take off his cap. Umar wanted Abu Ubaida to ask Khalid from what funds he gave to Ash'as: from his own pocket or from the state treasury? If he confessed to having used the spoils, he was guilty of misappropriation. If he claimed that he gave from his own pocket, he was guilty of extravagance. In either case he would be dismissed, and Abu Ubaida would take charge of his duties. Abu Ubaida was himself an admirer of Khalid and loved him as his younger brother, and so said that he was not capable of doing it. Instead, Bilal ibn Ribah was appointed for this task and called back Khalid from Chalcis to Emessa, where he was charged publicly. Khalid stated that he gave money from his own pocket and thus was declared innocent in that charge. However, when he went to Abu Ubaida, he told him that he had been dismissed on the order of Umar and is required to go back to Medina. Khalid went to Chalcis and said farewell to his mobile guard. He then went to Medina to meet Umar. He protested about what he considered to be injustice. Umar is said to have praised him in these words: "You have done; And no man has done as you have done. But it is not people who do; It is Allah who does..."
I have not dismissed Khalid because of my anger or because of any dishonesty on his part, but because people glorified him and were misled. I feared that people would rely on him. I want them to know that it is Allah who give us victory; and there should be no mischief in the land. It was in this way that Khalid's successful military career came to an end. Khalid's tomb is present in Khalid ibn al-Walid Mosque, Homs – Syria. Although it is believed that relations between Umar and Khalid, cousins, were always something short of cordial, both of them apparently harboured no ill-will towards each other. Upon his death, he bequeathed his property to Umar and made him the executor of his will and estate. I've fought in so many battles seeking martyrdom that there is no spot in my body left without a scar or a wound made by a spear or sword. And yet here I am, dying on my bed like an old camel. May the eyes of the cowards never rest. You must understand, O Khalid, that when the Messenger of Allah (Muhammad), on whom be the blessings of Allah and peace, named you Sword of Allah, he predetermined that you would not fall in battle. If you had been killed by an unbeliever it would have meant that Allah's sword had been broken by an enemy of Allah; and that could never be. May Allah have mercy on you, Abu Sulaiman (Khalid). What you have now is far better than what you had in life, for you are now with Allah. You were honored in life and content in death. 625 23 March Battle of Uhud Khalid ibn al-Walid as a Meccan commander defeats Muslim force led by Muhammad. Many Muslims were killed, and even Muhammad himself was badly injured. 629 Battle of Mu'tah A small Muslim Arab army confronts a larger joint force consisting of elements from the Byzantine Empire and allied Christian Arabs. Battle results in the death of the three Muslim commanders and a near rout of the Muslim army. Khalid assumed command of the Muslim forces and turned what would have been a bloody slaughter into a strategic retreat. In the third century A.H. (816 CE - 913 CE) Muslim historians would state that Muhammad bestowed upon Khalid the title of 'Saifullah' meaning 'The Sword of Allah'. 637 Battle of Hazir Khalid ibn al-Walid defeats the garrison of Qinnasrin under Meenas at Hazim in Syria, wiping out the Byzantine force. Map detailing the sites of Campaigns of Khalid ibn Walid. Khalid is said to have fought around a hundred battles, both major battles and minor skirmishes as well as single duels, during his military career. Having remained undefeated, he is claimed by some to be one of the finest military generals in history. As Khalid was the architect of most of the early Muslim military doctrines, he was also the pioneer of almost every major tactic that Muslims used during Early Islamic conquests. One of Khalid's major achievements in this context was utilizing the individual skills of Arab Bedouin warriors to a larger scale. He is believed to have developed them into an almost regular unit called Mubarizun ("champions"), who would issue personal challenges to the enemy officers. These were highly trained and skilled swordsmen, whom Khalid utilized effectively to slay as many enemy officers as possible, giving a psychological blow to enemy morale. The Battle of Ajnadayn is perhaps the best example of this form of psychological warfare. Moreover, his biggest achievement was the conversion of Arab tactical doctrine into a strategic system. Until Khalid, the Arabs were basically raiders and skirmishers. Khalid turned those skirmishing tactics into something that could be used anywhere. Thus he would skirmish the enemy to death: he would bring his army in front of his enemies and wait until the whole battle degenerated into a skirmishing affair between small units. Then, after exhausting the enemy units, he would launch his cavalry at their flanks employing Hammer and Anvil tactics. Much of Khalid's strategy lies in his use of extreme methods. He is said to have put more emphasis on annihilating enemy troops, rather than achieving victory by simply defeating them. For instance his employment of the double envelopment maneuver against the numerically superior Persian army at the Battle of Walaja, and his maneuver at the Battle of Yarmouk where he virtually trapped the Byzantine army between three steep ravines by stealthily capturing their only escape route, a bridge, at their rear. Khalid utilized his better understanding of terrain in every possible way to gain strategic superiority over his enemies. During his Persian campaigns, he initially never entered deep into Persian territory and always kept the Arabian desert at his rear, allowing his forces to retreat there in case of a defeat. It was only after all the strong Persian and Persian-allied forces were routed that he penetrated deep into Euphrates region and captured the regional capital of Iraq, Al-Hira. Again, at Yarmouk, the terrain would help him in executing his grand strategy of annihilating the Byzantines. In their mobility, Khalid's troops had no match until the Mongol hordes of the 13th century. In fact the tactics of the desert Arabs and steppe Mongols were somewhat identical. Entire troops of Khalid would ride on camels while on march, whereas the Mongols used horses, with the difference that the Arabs did not make use of mounted archers. His most commonly used maneuver was surprise attack, such as his night attacks from three different sides on Persian camps at Zumail, Muzayyah and Saniyy, his highly mobile army successfully maneuvering in a 100 km area, quickly destroying encampments of the Persians and their Arab allies. The Battle of Maraj-al-Debaj being no exception, where once again his highly mobile army maneuvered around a Byzantine army, appearing from four directions and opening several fronts at a time, a maneuver which later in 13th century became one of the Mongol armies' principal maneuvers. The ambassador took the daughter of Heraclius, and returned to Antioch. An example of Khalid's strategic maneuverability was his advance into Roman Syria. Emperor Heraclius had sent all his available garrisoned troops into Syria, towards Ajnadayn, to hold the Muslim troops at the Syria-Arabia border region. The possible route of any Muslim reinforcement was expected to be the conventional Syria-Arabia road in the south, but Khalid, who was then in Iraq, took the most unexpected route: marching through the waterless Syrian desert, to the surprise of the Byzantines, he appeared in northern Syria. Catching the Byzantines off guard, he quickly captured several towns, virtually cutting off the communications of the Byzantine army at Ajnadayn with its high command at Emesa, where emperor Heraclius himself resided. Khalid's elite light cavalry, the Mobile guard, acted as the core of the Muslim cavalry during the invasion of Syria. It was composed of highly trained and seasoned soldiers, the majority of whom had been under Khalid's standard during his Arabian and Persian campaigns. Muslim cavalry was a light cavalry force armed with 5 meter long lances. They could charge at an incredible speed and would usually employ a common tactic of Kar wa far literary meaning "engage-disengage", or in modern term: “hit-and-run.” They would charge on enemy flanks and rear, their maneuverability making them very effective against heavily armored Byzantine and Sassanid cataphracts. Khalid's famous flanking charge on the final day of the Battle of Yarmouk stands as testimony to just how well he understood the potentials and strengths of his mounted troops. He (Khalid) neither slept himself, nor did he let others sleep; nothing could be kept hidden from him. Khalid also remained military Governor of Iraq from 632–633 and Governor of Chalcis, the most strategic cantonment in Northern Syria. Though he was never active politically, it was rumored that his fame alarmed Umar, who then recalled him from the army. However, Umar's recall of Khalid was largely related to the Muslim population's belief in Khalid being irreplaceable. To relieve them of this belief, Umar recalled Khalid, to which Khalid agreed. Let the women of the Banu Makhzum say what they will about Abu Sulaiman (Khalid), for they do not lie, over the likes of Abu Sulaiman weep those who weep. It is also recorded that once Umar was sitting with his companions, someone recalled Khalid, Umar reportedly said: "By God, he was Islam's shield against the enemies, his heart was pure from every animosity". According to some narrations, on Umar's death bed, he named people who he would have appointed as successors to the Caliphate if they had been alive, and amongst those he named was Khalid. Khalid ibn Walid was a Sahabi (a companion of Muhammad), a fact which makes him a very respectable figure among Sunni Muslims. According to hadiths considered Sahih by Sunni Muslims, he was first referred to as "a Sword amongst the Swords of Allah" by Muhammad while he was describing the Battle of Mu'tah. In the series Omar, a TV show about the first years of Islam, the character of Khalid ibn al-Walid was portrayed by the Syrian actor Mehyar Khaddour. The character of Khalid ibn al-Walid was one of the main characters in the show. In 1976 American film The Message, Khalid was portrayed by Michael Forest in English version and Mahmood Said in Arabic version. In the 2006-2007 Syrian television drama series Khalid bin Walid, the lead character Khalid bin Walid was portrayed by Bassem Yakhour. In 1958 Egyptian film Khalid ibn Al Walid, the character Khalid was portrayed by Hossein Sedki. Khalid's reputation as a formidable general led to his inclusion as a "Great General" in Civilization V and the Warlords expansion to the Civilization IV video game, which attempts to include real historical people in its gameplay. The Pakistan Army's main battle tank (MBT), Al-Khalid is named after Khalid ibn al-Walid. The Bangladesh Navy's frigate BNS Khalid Ibni Walid is named after him. Kazi Nazrul Islam wrote a popular poem named "Khaled" while he was suffering from malaria, showing his respect to Khaled and grief for his colonized countrymen. The troops sent by the Pakistan Army in the Gulf War in Operation Desert Storm was named "Khalid Bin Walid Independent Armoured Brigade Group." It has been in active service in Saudi Arabia since. The UAE has named a street and metro station after him. Walid reportedly had many wives and many children from them. Only the names of his following children are recorded in history. Sulaiman, Khalid's eldest son, was killed during the Muslim conquest of Egypt, although other sources claim he was slain during the Muslim siege of Diyarbakir in 639. Muhajir bin Khalid died in the Battle of Siffin while fighting from Caliph Ali's side and Abdulreman ibn Khalid remained Governor of Emesa during the time of third Caliph Uthman ibn Affan and participated in the Battle of Siffin as one of the generals of Muawiyah I, he was also the part of Umayyad army that besieged Constantinople in 664. Abdulreman ibn Khalid was later to be appointed the successor of Caliph Muawiyah but according to some narrations, he was poisoned by Muawiyah, because Muawiyah wanted to make his son Yazid I to be his successor. The male line of descent from Khalid is believed to have ended with his grandson, Khalid bin Abdur-Rahman bin Khalid. ^ a b c Khalid ibn al-Walid, Encyclopædia Britannica. Retrieved. 17 October 2006. ^ Alkhateeb, Firas (2017). Lost Islamic History: Reclaiming Muslim Civilisation from the Past. Oxford University Press. p. 43. ISBN 9781849046893. ^ Muhammad ibn Saad, Tabaqat vol. 8. Translated by Bewley, A. (1995). The Women of Madina pp. 195-196. London: Ta-Ha Publishers. ^ Ghadanfar, Mahmood Ahmad (2001). The Commanders of Muslim Army. Darussalam Publishers. p. 31. ^ Ghadanfar, Mahmood Ahmad (2001). The Commanders of Muslim Army. Darussalam Publishers. p. 42. ^ "List of Battles of Muhammad". Military.hawarey.org. 28 October 2005. Archived from the original on 11 June 2011. Retrieved 28 August 2011. ^ a b The sealed nectar, By S.R. Al-Mubarakpuri, Pg256. Books.google.co.uk. January 2002. Retrieved 28 August 2011. ^ a b ""He sent Khalid bin Al-Waleed in Ramadan 8 A.H", Witness-Pioneer.com". Witness-pioneer.org. 16 September 2002. Archived from the original on 27 September 2011. Retrieved 28 August 2011. ^ The life of Mahomet and history of Islam, Volume 4, By Sir William Muir, Pg 135. Books.google.co.uk. 1861. Retrieved 28 August 2011. ^ al-Tabari, Victory of Islam, trans. Fishbein, Albany 1997, pp. 188 ff. ^ a b Abu Khalil, Shawqi (1 March 2004). Atlas of the Prophet's biography: places, nations, landmarks. Dar-us-Salam. p. 239. ISBN 978-9960-897-71-4. ^ a b Abū Khalīl, Shawqī (2003). Atlas of the Quran. Dar-us-Salam. p. 244. ISBN 978-9960-897-54-7. ^ Muir, William (10 August 2003). Life of Mahomet. Kessinger Publishing Co. p. 458. ISBN 978-0-7661-7741-3. ^ Muhammad Khalid, Khalid (2004). Men Aroud The Messenger. Islamic Book Service. p. 125. ^ History of the World, Volume IV [Book XII. The Mohammedan Ascendency], page 463, by John Clark Ridpath, LL.D. 1910. ^ Muhammad Khalid, Khalid (2004). Men Aroud The Messenger. Islamic Book Service. p. 128. ^ Powers, David S. (2009). Muhammad Is Not the Father of Any of Your Men: The Making of the Last Prophet. University of Pennsylvania Press. ^ Akram, c. 30, p. 17. ^ Bukhari: Military Expeditions led by Mohammed (Al-Maghaazi), which states "Narrated Anas: The Prophet had informed the people of the martyrdom of Zaid, Ja'far and Ibn Rawaha before the news of their death reached. The Prophet said, "Zaid took the flag (as the commander of the army) and was martyred, then Ja'far took it and was martyred, and then Ibn Rawaha took it and was martyred." At that time the Prophet's eyes were shedding tears. He added, "Then the flag was taken by a Sword amongst the Swords of Allah (i.e. Khalid) and Allah made them (i.e. the Muslims) victorious." ^ Ring and Salkin, 1996, p.193. Ring, Trudy; Salkin, Robert M. (1994). International Dictionary of Historic Places. Taylor & Francis. ISBN 1-884964-03-6. Abdallah bin Abi Quhafah, popularly known as Abu Bakr, was a companion and—through his daughter Aisha—a father-in-law of the Islamic prophet Muhammad. Year 634 (DCXXXIV) was a common year starting on Saturday of the Julian calendar. The denomination 634 for this year has been used since the early medieval period, when the Anno Domini calendar era became the prevalent method in Europe for naming years. The Muslim conquest of Persia, also known as the Arab conquest of Iran, led to the end of the Sasanian Empire of Persia in 651 and the eventual decline of the Zoroastrian religion. 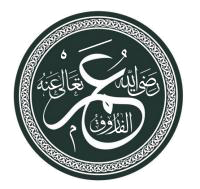 Abu Ubaidah ibn al-Jarrah, fully Abū ‘Ubaydah ‘Āmir ibn ‘Abdillāh ibn al-Jarāḥ, was one of Companions of the Islamic prophet Muhammad. Mostly known for being one of the "Ten Promised Paradise". He remained commander of a large section of the Rashidun Army during the time of the Rashid Caliph Umar and was on the list of Umar's appointed successors to the Caliphate. The Muslim conquest of the Levant, also known as the Arab conquest of the Levant occurred in the first half of the 7th century, and refers to the conquest of the region known as the Levant or Shaam, later to become the Islamic Province of Bilad al-Sham, as part of the Islamic conquests. Arab Muslim forces had appeared on the southern borders even before the death of prophet Muhammad in 632, resulting in the Battle of Mu'tah in 629, but the real invasion began in 634 under his successors, the Rashidun Caliphs Abu Bakr and Umar ibn Khattab, with Khalid ibn al-Walid as their most important military leader. The Battle of Bosra was fought in 634 between the Rashidun Caliphate army and the Byzantine Empire for the possession of Bosra, in Syria. The city, then capital of the Ghassanid kingdom, a Byzantine vassal, was the first important one to be captured by the Islamic forces. The siege lasted between June and July 634. 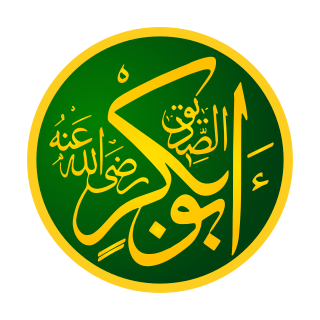 Umar was the second Rashidun Caliph and reigned during 634-644. Umar's caliphate is notable for its vast conquests, aided by brilliant field commanders, he was able to incorporate present day Iraq, Iran, Azerbaijan, Armenia, Georgia, Syria, Jordan, Palestine, Lebanon, Egypt, and part of Afghanistan, Turkmenistan and south western Pakistan into the empire of the Muslims. All of these were permanent conquests. The Byzantines lost more than three fourths of their territory and in Persia, the Sassanid empire ceased to exist. The Rashidun Caliphate was the first of the four major caliphates established after the death of the Islamic prophet Muhammad. It was ruled by the first four successive caliphs (successors) of Muhammad after his death in 632 CE. These caliphs are collectively known in Sunni Islam as the Rashidun, or "Rightly Guided" caliphs. This term is not used in Shia Islam as Shia Muslims do not consider the rule of the first three caliphs as legitimate. The Siege of Damascus (634) lasted from 21 August to 19 September 634 AD before the city fell to the Rashidun Caliphate. Damascus was the first major city of the Eastern Roman Empire to fall in the Muslim conquest of Syria. The Siege of Jerusalem was part of a military conflict which took place in the year 637 between the Byzantine Empire and the Rashidun Caliphate. It began when the Rashidun army, under the command of Abu Ubaidah, besieged Jerusalem in November 636. After six months, the Patriarch Sophronius agreed to surrender, on condition that he submit only to the Caliph. In April 637, Caliph Umar traveled to Jerusalem in person to receive the submission of the city. The Patriarch thus surrendered to him.